Sometimes this wine writing gig has its upsides. Sure the money is almost mythical, the prospects limited, the hours long. Yet at least you get to eat and drink well. The venue: Balla, Steve Manfredi’s ‘osteria’ located within The Star precinct. Who: Isole e Olena proprietor Paolo De Marchi, with the event arranged by Ian Cook from Five Way Cellars, in conjunction with The Star and Negociants (Australian importers of Isole e Olena). 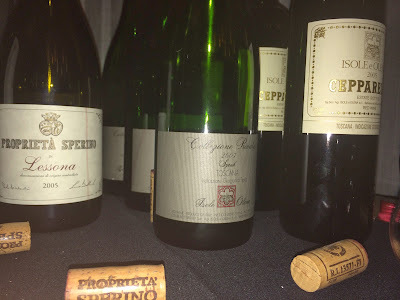 Steve Manfredi was on hand to talk through the food (and confess his love for Paolo’s wines). Crowd: Mainly consumers, who had all paid to attend the dinner. I was a glad freeloader. Food: The ravioli and bistecca, in particular, were big highlights – seriously good. Lovely ‘Tuscan inspired’ flavours on offer, which just made me want to go even more (Chianti is on the cards for August, Bring it). Story: This is Paolo’s 38th year of winemaking. he ‘hopes to be able to relax a little bit soon’. He really doesn’t seem to be slowing down though. Rather, he’s very keen to push the wines of his son, sourced from the original family farm in northern Piedmont. There has also been considerable change in Chianti, where the main estate winery is located, with a huge shift in the nature of land use. Much of it happened very quickly too, as Paolo described:. The change came on the back of a cultural evolution too, with wine evolving from ‘food for the peasant’ to a legitimate business focus. 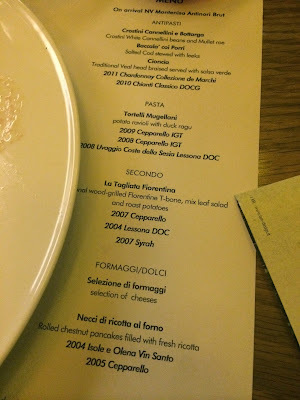 My expectations were high (and I have some Cepparello in the cellar) and the wines delivered. These are charismatic and genuine wines reflective of their maker and region. I didn’t quite love the Nebbiolo pair but I can fully appreciate the style and mode. A personal preference thing perhaps. Chardonnay was introduced as a blending grape, intended to help lift up the basic Tuscan white blend – what Paolo called ‘an ordinary wine style’ (largely Trebbiano based). The Chardonnay was eventually kept separate. This includes a little Syrah, planted to help give something to the blend. 100% Sangiovese, sourced from the estate vineyards in the northern part of Chianti Classico. Aged in French oak barrels. According to Paolo ‘Sangiovese is not forgiving when you make mistakes’. The secret to the success of this wine is all about the best Sangiovese fruit. Oak swathed all over the nose. Initially I thought this was too oaky, the oak obfuscating the palate. Thankfully I left my glass and came back to a point where the oak seems to meld into the quite black fruit. It’s still a flashy wine – maybe not flashy for Tuscan reds, but flashy for 100% Sangiovese – though clearly the sandy tannins are all Sangio. Sourced from Paolo’s son Luca’s vineyard in Lessona. A blend of Nebbiolo with the earlier ripening Vespolina and Croatina. Straight Nebbiolo and treated more like a traditional Barolo, with a long natural ferment and extensive barrel ageing in a variety of barrels and big oak. From a very warm vintage in Tuscany. Choc mocha oak. Milky and leafy with a warm hearted core. Feels a little forward and stunted in this company. Coffee. Malt. Cocoa pops. Flat and open and warm. Length not quite of this class. In cork. ‘We tasted two bottles and people understand why we use Screwcap’. ‘The lazy winemakers wine’. The quite neutral fruit (Malvesia and Trebbino) for this is air dried, put in small barrels on used lees then sealed for 7 years. VA can be a big problems with this style as Paolo wryly notes ‘Sometimes Vin Santo likes to be a sibling of balsamic vinegar’. Apparently this was a very warm year and a simple wine initially, made complex with some of the wildest barrels (hence the volatility).